Welcome to Heirloom Stained Glass on the Web. 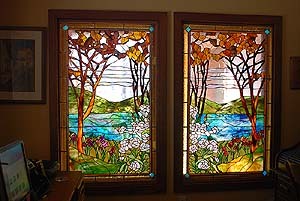 Hand crafted Stained Glass Windows and Stained Glass Lamps from Northwest Arkansas. Heirloom Stained Glass, nestled in the Arkansas Ozarks, is committed to offering uniquely beautiful, high quality creations in stained glass. The exquisite beauty and permanence of these pieces truly makes them an investment that will become a family heirloom, and I'm exceedingly proud to be the craftsman in the process! Heirloom Stained Glass is a privately owned business. All fixtures are individually developed and created by Hank Barnes. 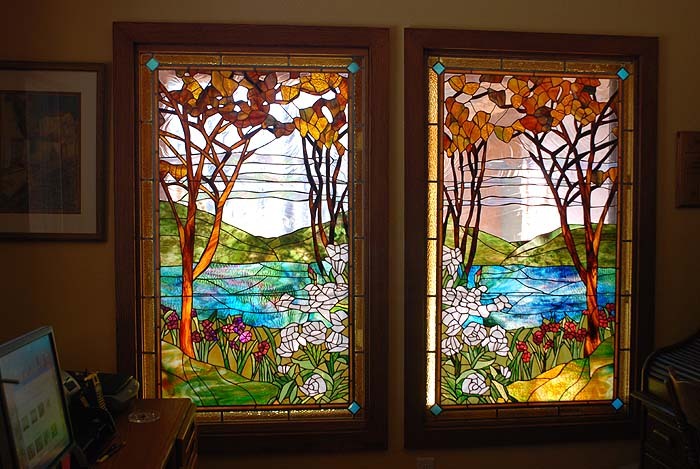 Heirloom Stained Glass can create custom Lamps, Windows, Transoms, Tiffany reproductions, Kaleidoscopes, and a variety of other fixtures to any size and color specification. Throughout most of this web site, click on images to enlarge.